Last year, the Virginia Ag Pest Advisory (an email subscription list) became the Virginia Ag Pest and Crop Advisory blog. As with the old system, you receive weekly emails containing important advisories on your mobile or desktop device, and you can scroll the titles and select only those that are important to you. Normal advisories will be delivered each Friday at 1 am and available for reading first thing on Friday mornings. And as before, there is an ‘Urgent’ option that will be used to provide any advisories that need immediate attention. I call this to your attention because from now on, I will be publishing up-to-date advisories on the Virginia Ag Pest Advisory and not this blog. Instead, I’ll use the Virginia Soybean Update blog for more general soybean-related subjects will possibly more detail. A few weeks ago, I thought double-crop soybean planting would be delayed due to a late wheat crop. However, the wheat seems to have caught up in most areas. So, we’re right on track to producing another good soybean crop. Virginia data estimates that every delay in planting past mid-June will cost you about 1/2 bushel per acre. Using future prices (approximately $12/bushel), this translates into about $6 loss per day. The exact date when yield drops rapidly from delayed planting cannot be predicted; some years this may be June 10 and others this could be July 10. Yet, on average, the date is in the second or third week of June. Therefore, be sure that the planter is following close behind the combine. Also, our data indicates that we need, on average of 180,000 plants per acre to economically maximize yield. Yes, this is double what is needed for full-season production, but it will usually pay. Note that I stated, “on average”, however. Like most things, averages rarely reflect the season. If we have plenty of rainfall early in the year that stimulates vegetative growth, then we won’t need as many plants. Likewise, if you’re growing soybean on a field that consistently averages 50-60 bushels (rarely experiences severe water stress during the vegetative stages), then less seed is required. But, if you have poor vegetative growth followed by relative good conditions during pod and seed development, more plants will maximize yield. I can’t predict the season; therefore I use the average response. If you need more information, contact me. What if soil moisture is lacking? My philosophy is to plant into moisture. By June and July, the soil is warm, therefore you can plant deeper to reach moisture and get adequate emergence. But, don’t plant deeper than 2 inches; I prefer 1 to 1.5 inches. Although many disagree with me, I don’t recommend planting into dry soils and waiting for a rain. Why? I don’t often see a entire field that is completely dry unless it is a tilled field. I’m not saying this is not possible; wheat and barley can extract nearly all of the moisture from the soil. But, dry fields usually contain some wetter areas. And these wetter areas will sometimes contain enough moisture to germinate the seed but not enough for it to emerge. This results in re-planting, which can be expensive. Still, the soybean seed will usually wait for a rain; so planting into dry soils is an option, especially if you have large acreages. While most of our double-cropped soybean were planted in a timely manner, many acres were not. And I use the word “timely” very loosely here. This year, “timely” means that they were planted by early- to mid-July. Usually I refer to July planting as “late”, even if the soybean are planted during the first week of July. But, the wet June and July did not allow “timely” planting in many parts of the Commonwealth. Much of Virginia’s double-crop soybean were planted in July and some acres were even planted in early-August. As a review (maybe a disclaimer? ), I did suggest that we continue planting soybean though mid-July because I’ve seen some pretty good yields (in the 30’s) from July-planted soybean. But, planting after mid-July is always risky. With a relatively warm and sunny August and September, late-July and even August-planted beans can catch up and mature before the frost – if the frost waits until early-November. Of course, this year was neither warm or sunny and our first frost came in late-October. Maturity was slowed. The end result is frost- and freeze-damaged soybean. Freeze-Damaged Immature Soybean. 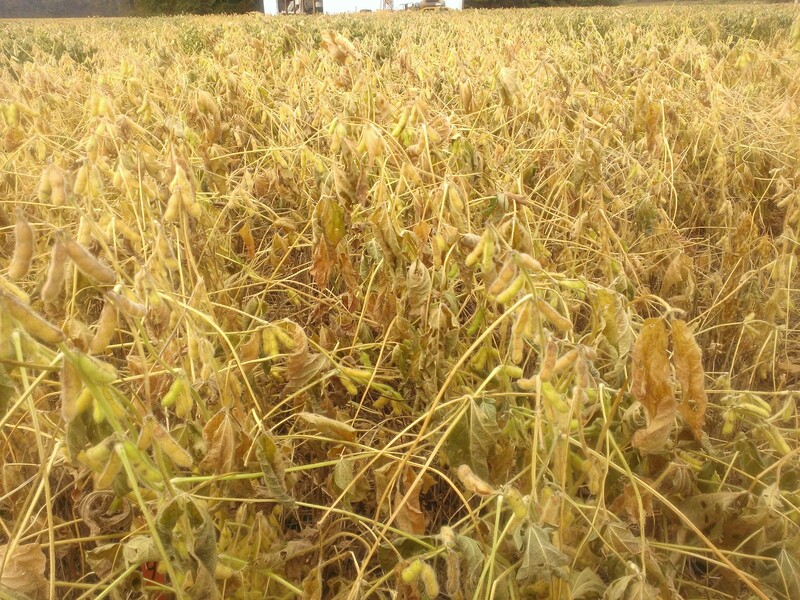 Soybean were in the R6 stage (green pods and seed) and a hard freeze killed the plant. In this worst case scenario, the crop will not mature and you’ll be left with green seed that you cannot sell. Hopefully very little of our crop experienced this. Frost-Damaged Immature Soybean. Soybean was in the R6 stage and a frost damaged many of the leaves on the plant (see photo above). In this case, the plants were not killed; therefore, they should continue to mature. But, maturity will be delayed and drying time will be extended. I cannot guarantee that you won’t have some green seed when you harvest, but the number should be much less than for scenario 1. This all depends on how close you were to physiological maturity (R7). And, it’s very likely that the seed will be smaller (photosynthate from the leaves can’t move to the seed if the leaves aren’t there). Frost/Freeze-Damaged Mature Soybean. 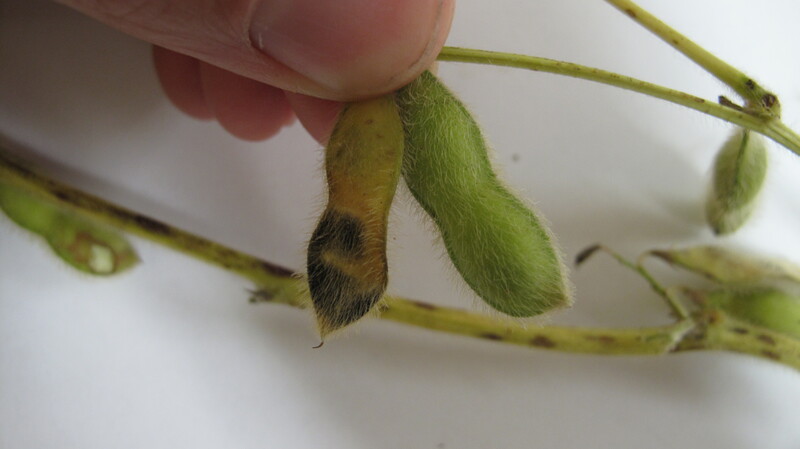 Soybean were physiologically mature (R7 stage; at least one pod on 50% of the plants has reached its final brown color). In this case, whether the crop experienced just a frost or a even a hard freeze, the crop will mature but the seed will take a little longer to dry. Regardless of the scenario you may be experiencing, there are some management tactics that you can use to minimize further damage. Instead of spelling out all of these tactics myself, I’ll borrow an article from Mike Staton, Michigan State University Extension Educator. He is probably more experienced with frost/freeze-damaged soybean than I and he has summarized the issue well. 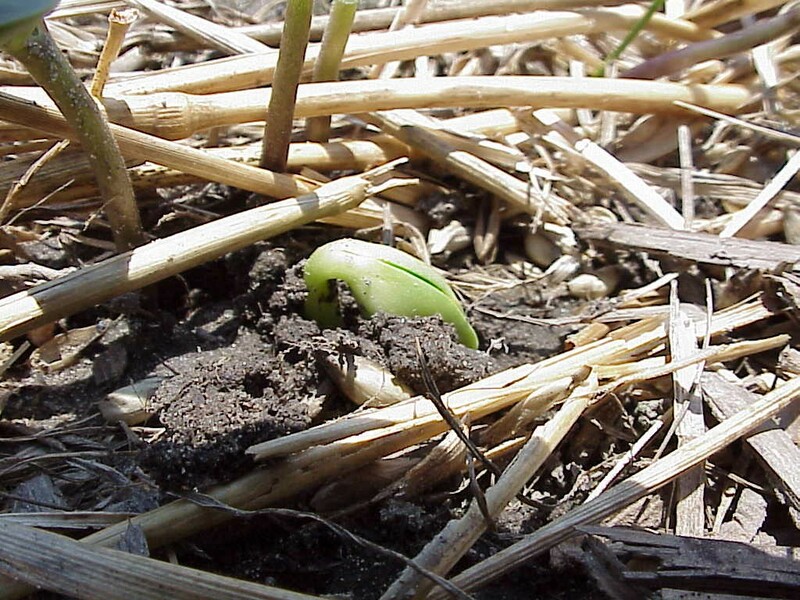 This article will help soybean producers reduce the adverse effects of an early frost. The late planting season combined with some early frost events has increased the potential for frost damage to occur in soybeans this fall. 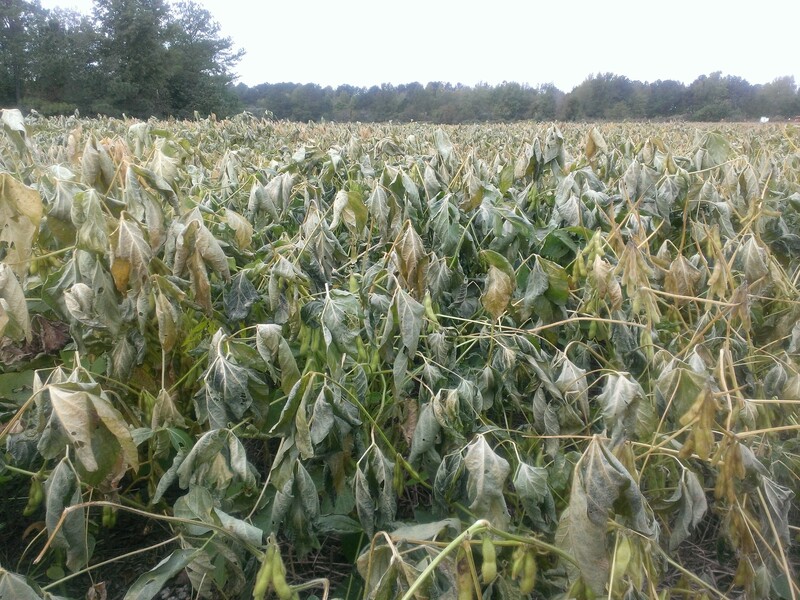 The following recommendations from Michigan State University Extension will help you reduce the adverse impacts in the event that some of your soybean fields are damaged by frost. Frost-damaged soybeans are generally considered salvageable as long as the plants reached the R6 growth stage at the time the killing frost occurred. The R6 growth stage occurs when the beans completely fill one pod at one of the upper four nodes on the main stem on 50% of the plants in the field. In dense, green soybeans, frost/freeze damage kills the upper leaves but rarely penetrates deeply into the canopy when temperatures remain above 30o F. However, once the upper leaves have been damaged, subsequent freeze events will penetrate deeper into the canopy. Once the plants reach the R7 growth stage, yield reductions due to frost/freeze injury will be minor. The R7 growth stage occurs when one pod on the main stem has attained its mature color on 50% of the plants in the field. Frost-damaged beans will probably be wetter than normal and more difficult to thresh. Your first step in adjusting for this condition is to reduce the concave clearance. If acceptable threshing still does not occur, increase the speed of the cylinder. Make incremental adjustments and check your progress after each adjustment. Soybeans that experienced severe frost/freeze damage extending well into the crop canopy will dry down slowly. In this case, producers should avoid significant harvest delays by harvesting frost-damaged fields at moisture levels between 16 and 18%. Data from the University of Wisconsin showed that shatter losses of 0.2 bushels per acre per day occur after the beans reach 16 to 18% moisture. The beans will need to be dried to a safe moisture level for storage (12% for 6 months). Electronic moisture meters tend to underestimate the moisture levels in green and immature soybeans so remember to add 1.5 percentage points to the moisture meter readings when testing mixtures of green, immature and mature beans and adjust drying times accordingly. In fields where only the upper leaves were damaged by frost, producers should wait and allow the beans to mature and dry to 14 to 15% in the field if possible. If only 2 to 3 points of moisture need to be removed, the air temperature is above 60o F and below 75% relative humidity; no supplemental heat is required in drying bins equipped with full perforated floors and fans capable of producing one to two cfm/bu. However, drying will occur slowly. Drying times depend on initial moisture content, air flow, grain depth and weather conditions. Aeration fans should be run continuously as long as the beans are above 15% moisture and the average humidity of the air is below 70 to 75%. If you plan to add supplemental heat, be careful as soybeans are more fragile than corn and can be damaged by drying temperatures above 130o F. These temperatures will cause excessive seed coat cracking and split beans. The relative humidity of the drying air should always be maintained above 40% to protect the integrity of the seed coats and prevent splits. Relative humidity is cut in half for each 20 degrees that the air is warmed. Growers can control the heat and humidity of the drying air by using short burner cycles or by changing the burner jets. Green and immature soybeans are included in the total damage factor in the U.S. soybean grading standard. Elevators will discount loads containing green and immature soybeans and in some cases may reject entire loads if the damage levels are high. Discounts can be reduced by screening out the small beans, drying the rest to 12% moisture and storing them in aerated bins for at least six weeks. The green color may fade and marketing concerns should be reduced after this amount of time. This article was produced by the SMaRT project (Soybean Management and Research Technology). The SMaRT project was developed to help Michigan producers increase soybean yields and farm profitability. SMaRT is a partnership between MSU Extension and the Michigan Soybean Checkoff program. The following is a question directed to me by one of our County Agents. It’s an excellent question that is worth repeating and relates to the flat pods that are evident in this year soybean crop. I looked at our soybean variety test here in Suffolk yesterday. I too am seeing lots of flat pods (seed have aborted within the pod). Basically, something is causing the seed not to fill out in the pods. There are several things that can cause the flat pods. You mentioned two of them – stinkbugs and disease. However, if you are not seeing punctures or black/brown seed within the pod, it’s not likely stinkbug. Certain disease can also cause seeds not to fill out. Basically anything that restricts movement of water or photosynthates through the plant and eventually into the seed can result in flat pods. This could be a stem or root disease that is restricting movement of nutrients to the seed. It could also reflect a nematode infestation coupled with dry weather; hence restricting root uptake and resulting in drought effects. Or it could be a foliar disease that has lessened leaf area; therefore, reduced the amount of photosynthate into the seed. The first photo is showing symptoms of Cercospora blight and leaf spot on the stem in the background. 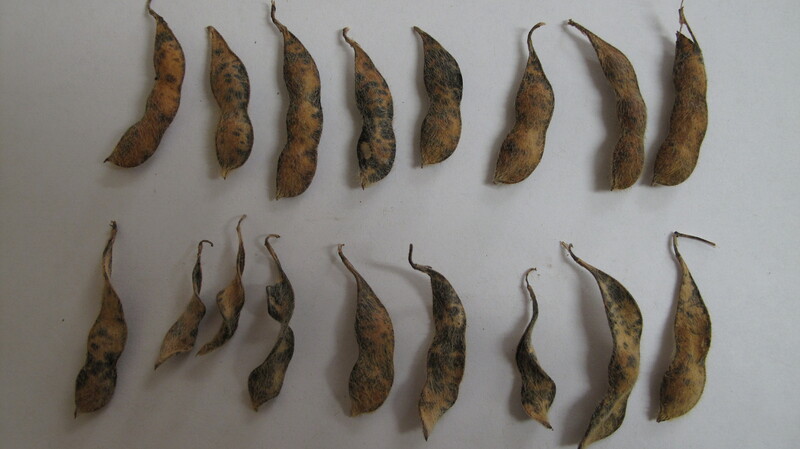 The photo to the right also seems to be showing symptoms of this disease on the pods, although those symptoms could also reflect phomopsis or another late-season disease. Cercospora blight and leaf spot, along with several other foliar diseases, was rampant this year. Foliar disease can result in less effective leaf area, but also early defoliation; the result in less photosynthate to fill the seed. Still, the most likely culprit is the dry weather we experienced in September. We had very good yield potential going into September. There were lots of pods and most of these pods were set (they were not going to abort). 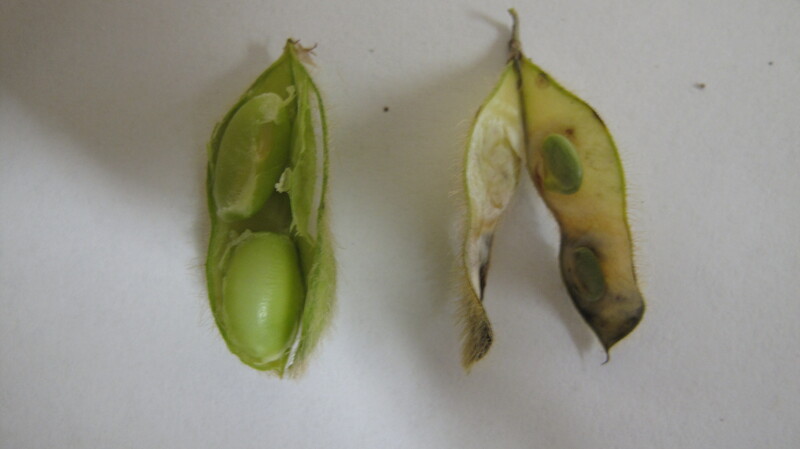 Therefore, the effect of the drought at this time would not be less pods (the most important component of soybean yield), but less viable seed per pod or smaller seed size. When the crop can no longer support the pods and seed load on the plant, something has to give. In my opinion, the aborted seed in the pod (resulting in flat pods) that we are experiencing is primarily the result of a dry September. Drought stress is largely responsible for the flat pods. In addition to the flat pods, I think we’ll also see smaller seed that we have in the past. Seed size is usually the second most important component of yield, behind pod number. But with the large number of flat pods (less seed per pod), we may not see as big of an effect on seed size, especially with the recent rainfall. Regardless of whether the problem is aborted seed within the pod or seed size, our yields will likely be lower than we think they will based on a visual inspection because of less seed per pod or smaller seed. Finally, keep in mind that a combination of things (drought stress, disease, etc.) may be causing the flat pods. In my experience, I rarely can attribute such an event to just one factor. If you take the “glass half full” attitude, this could be an opportunity to discover an unknown problem (nematodes, compaction, improper variety selection, etc.) and begin future efforts to solve the problem. If this is occurring in just one field and not another that is close by; then it’s an opportunity to find out what’s wrong with that field. The take-home message is that soybean will compensate for stresses by either dropping pods, producing less seed per pod, aborting seed (resulting in flat pods), or reducing seed size, depending on when the stress occurs. The timing of the dry weather following a very wet year that resulted in a heavy pod load likely resulted in the flat pods that we’re experiencing. If you have further comments or questions, please contact me and/or respond to this post. Last week, soybean rust (SBR) was confirmed in several more counties in Virginia bringing the total to eight (Suffolk, Chesapeake, Virginia Beach, Isle of Wight, Hanover, Prince George, Brunswick, and Sussex). The level of infection on soybean leaflets was low, and though we have confirmed the fungus is present throughout the region, we are not seeing much disease development. This is probably due to dry weather conditions, and fortunately, this has allowed for most of the soybean crop to reach R6 and escape the threat of yield losses from SBR. The fact that the fungus has spread but caused little disease is a good illustration of how important environmental conditions are to the development (or lack of development) of disease epidemics. Even if the weather conditions do become more conducive, there is not enough time left in the season for SBR to reach high enough levels to impact yield. The SBR fungus arrived relatively early in Virginia this year, but it is unlikely to impact the soybean crop in the state. The standard recommendation for control of SBR once it is confirmed within 100 miles of a crop is to spray soybeans that have not yet reached the R6 stage with triazole or pre-mix fungicides. However, an important caveat to the rule this late in the season is that the crop should also have good yield potential. Otherwise, there may be little or no economic benefit to fungicide sprays. Both Dr. Holshouser and Dr. Rideout concur that the threat of SBR to Virginia soybeans has likely passed. As always, feel free to contact me if you have any specific questions or concerns. Wow, leave the country for a couple of weeks and all hell breaks loose. Actually, it wasn’t that bad. But, the day that I arrived in Beijing, I received notice from Dr. Hillary Mehl, Extension Plant Pathologist, that soybean rust was discovered in Suffolk. This may have been the earliest that we’ve discovered the disease in Virginia. And it came in a year that many of our soybean had not yet reached the R6 (full-pod) stage. So, Dr. Mehl went into attack mode and begin letting everyone know of the discovery. Overall, I think that our communication system worked well. Then the question of whether to spray or not began to arise. We took the conservative approach and recommended that all soybean that had not reached the R6 stage and was within 100 miles of the Tidewater AREC should be treated with a triazole fungicide. This recommendation really only affected our late-planted double-crop soybean as our full-season soybean crop and much of the double-crop soybean that were planted in late June had already reached the R6 stage. Was this recommendation correct? Yes, I believe it was. But, only because we cannot predict future weather conditions. In actuality, the dry weather slowed down the disease’s spread. It really never got worse in Suffolk, where we first found it. Yes, it has now been confirmed in several other counties (see the map below for the latest update), but the incidence and amount of leaf coverage is very low. So, in the end, a fungicide application would probably have done little good. But, we will verify this with our research plots. Will the disease continue to spread? If we get the rainfall early next week, I think we’ll see it start sporulating again and begin spreading a little faster. But, I’d think that most of our soybean are safe now. If the soybean hasn’t yet reached R6, then a frost may make the disease irrelevant. Plus, it’ll take a few weeks before the disease will get to yield-reducing levels. By that time, our crop will like be physiologically mature. We’ll keep looking an tracking the disease’s spread and incidence. We should be able to learn much from this year. And this knowledge will help us to make better decisions in the future. On September 17, 2013 soybean (SBR) rust was observed and confirmed on soybean leaves collected from the Tidewater AREC sentinel plots on September 5. Suffolk is the only county in Virginia thus far with confirmed soybean rust, but we will now intensify our scouting efforts throughout the soybean-growing regions of the state. 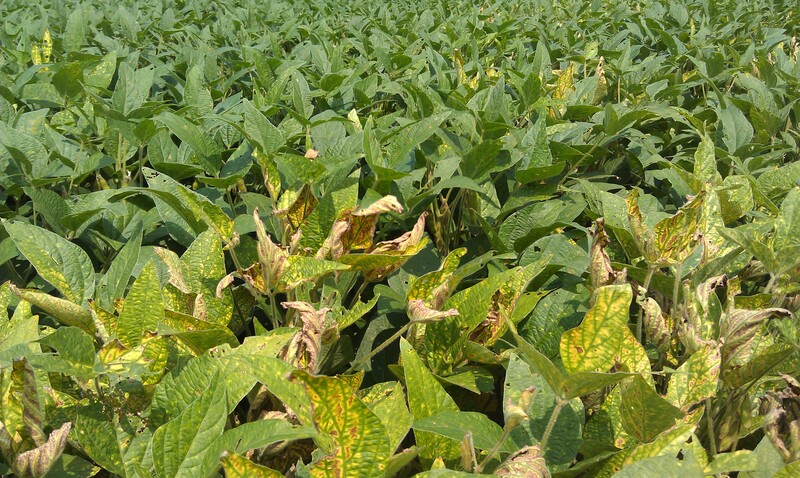 Extension agents and growers should continue scouting for SBR in their respective counties and submit soybean leaves to the Tidewater AREC Plant Disease Clinic for evaluation of SBR and other foliar disease. So far in 2013, SBR has been confirmed on soybeans in 185 counties/parishes in 10 states in the U.S. (AL, GA, FL, MS, LA, SC, AR, NC, TN, and VA) including two counties in North Carolina and one county in SE Virginia. Soybean sentinel plots and commercial fields are monitored annually for early detection of SBR and tracking of disease spread. Data are used to make recommendations for timely applications of fungicide sprays for control of SBR. Since August, soybean leaflets from sentinel plots at the Virginia Tech Tidewater AREC in Suffolk, VA have been evaluated on a weekly basis, and as in prior years, the first report of SBR in Virginia was from one of these sentinel plots. Other diseases in soybeans at this time include Cercospora blight, brown spot, frogeye leaf spot, and anthracnose. Risk of yield loss in soybean is minimal if SBR is detected following the R6 development stage. However, growers with soybeans that have not yet reached the R6 stage should consider spraying fungicides for control of SBR (triazole or pre-mix fungicide). This is particularly relevant for late-maturing/double-cropped soybean. As part of the scouting effort and to track the spread of SBR throughout Virginia, extension agents are encouraged to submit soybean leaf samples (50 leaflets per sample) for evaluation of soybean rust and other diseases. Moisture is required for infection and development of SBR, so it is best to collect leaves from fields shaded from the sun in the morning since these areas will hold moisture within the canopy longer. A detailed protocol for scouting SBR is attached. Samples should be submitted to the Tidewater AREC with the attached SBR diagnostic form. We are receiving reports and samples of soybean with symptoms of Brown Stem Rot (BSR) on an almost daily basis at the Tidewater AREC. 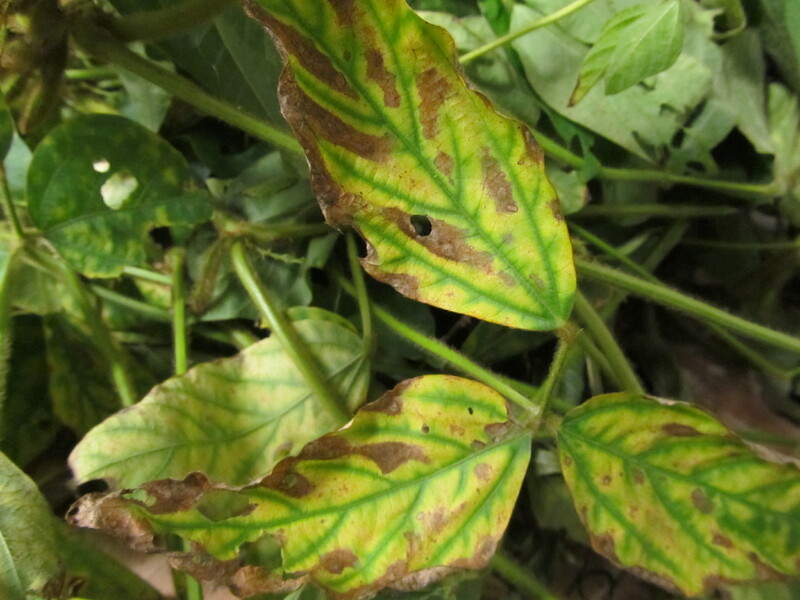 The most obvious symptom of the disease is interveinal chlorosis and necrosis of the leaves though this can be indicative of other pathogens and should not be considered diagnostic. “Look-alike” diseases we have seen this year and how to distinguish them from BSR are indicated in the Table below. A few of the soybean samples submitted to the Tidewater AREC have been diagnosed with Stem Canker and one sample had signs/symptoms of Sudden Death Syndrome (SDS, we are in the process of confirming this with a root/stem biopsy). Depending on the region, Brown Stem Rot is reported as being either insignificant or economically important in soybean. In south-eastern Virginia, Dr. Pat Phipps has not previously observed the severity of BSR that is being reported this year. In previous years, it was common to see diseased and healthy plants side-by-side with diseased plants scattered throughout the field. This year we have seen some large areas up to an acre with all the plants exhibiting symptoms of BSR. The increased incidence and severity of the disease is likely due to a combination of factors including the wet weather we have had this year as well as increased soybean production and shorter rotations out of soybean. The fungus causing BSR (Phialophora gregata) overwinters on soybean residues and builds up in the soil with soybean cropping. Severity of BSR and yield-reducing potential has been associated with fungal population levels in the soil, so reducing inoculum by rotating out of soybean for 3-5 years is one of the best management strategies for BSR.